Picture this: an idiosyncratic bedroom furnished with austere antiques; windows that open onto peaceful parkland where the verdant views are only interrupted by the graceful shape of a Baroque church; and at the end of your stay, a bill that totals little more than what you’d pay for a pizza at the local restaurant. Is it a dream? No, it’s a room in a monastery’s guesthouse. Many Italian monasteries and sanctuaries offer accommodation—indeed, for some it is part of their religious mission. Of course, the majority prefer to host clergymen, or people in search of a spiritual retreat. But others are happy to take in families, couples and singles looking for an unusual place to stay at a budget that won’t break the bank. 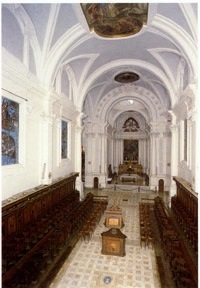 Each monastery is different—some, such as the Eremo della Transfigurazione in Spello, Umbria, like guests to take part in the monks’ life and help with their toils; others, such as the Hotel Romito of the Santuario di Santa Maria Montevergine, in Montevergine, Campania, offer a hotel like service managed by private operators in buildings that belong to the convent; many provide spartan accommodation, but a few, such as the Santuario di Oropa, in Oropa, Piedmont, offer luxurious rooms complete with antique paintings and furniture; several, such as the Monastero di Bose in Magnano, Piedmont, don’t even have a set room rate—they just ask for a minimum offer. Invariably all will ask you to respect their rules and their way of life. If you like your holiday loud and proud, a monastery may not be a place for you. In all other cases, however, staying at religious guesthouses is more than a cheap choice—it is a life experience. To help you find the right one for you, we have picked three of the best ones across Italy. Always call in advance to arrange your stay, especially if you have children, as they are not always welcome. Both the sanctuary and the accommodation at Oropa look anything but monastic. Set against the backdrop of emerald lawns and soaring Alpine peaks, the monastery is a triumph of Baroque, Rococo and Ottocento architecture, designed by some of the greatest names of the times—royal architects Pietro Arduzzi and Filippo Juvarra were two of the many that gave shape to the grandiose complex between the late 1600s and the early 1700s. The heart of the sanctuary is the Baroque Basilica Antica, built around an ancient chapel that houses a wooden sculpture of a black Virgin. Oropa was a religious retreat for the Savoy royal family, who kept lavish apartments at the complex (now open to the public). Guest accommodation nearly rivals the royal home in opulence. There are more than 300 rooms, all furnished with antiques—from the austere, affordable Camere Turistiche (with sober wrought iron beds, simple wooden tables and chairs, and no private bathroom) to the extraordinary Suites, which have elegant period armchairs, beds and bureaux, original prints and paintings and, of course, perfect ensuite bathrooms. And if this weren’t enough, the food served in the 13 restaurants that surround the sanctuary, is substantial, mouth-watering Alpine fare—hearty raclette, chocolate fondue, soft Toma Biellese cheese—which can be washed down with a glass of Ratafia liqueur. The sanctuary also makes and sells the nutty Mucroncino chocolates and crunchy canestrelli biscuits. Room rates range from €20 per night for a single Turistica room in the low season to €119 per night for a three-bed suite in the high season. Comfort rooms and junior suites, both of which have ensuite bathrooms, are priced from €32 and €46 respectively. Discounts apply for stays of more than three nights. Oropa is the perfect base for nature walk (the area surrounding the sanctuary is a nature reserve), hiking, mountain biking and skiing (both Alpine and Nordic). For more information, check: www.santuariodioropa.it (in Italian only), call +39 015 25 551 200 or email info@santuariodioropa.it. The Weissenstein stands white and ornate like a wedding cake on a slope ringed by verdant fir woods and the snow-capped peaks of the Dolomites. Story has it that the sanctuary was the result of a miracle. The Virgin appeared to a local farmer, Leonardo Weißensteiner, ridding him of a disease that had plagued him for years. In return, she asked him to build a chapel where the faithfuls could go and worship. Weißensteiner did so in the mid 16th century, but the chapel became so popular with pilgrims that it soon became necessary to replace it with a church. 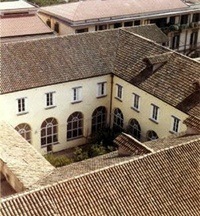 The larger complex was built in the 17th century and remodelled in the 18th century in lavish Rococo style. 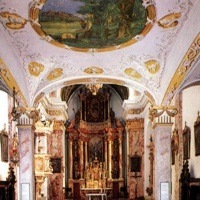 The main altar is covered in silver and golden leaves, the ceilings have elegant frescoes by Adam Mölk and a magnificent statue of the Sorrowful Virgin takes pride of place in the church. Despite its huge popularity, the sanctuary went close to destruction in the late 18th century, when the Austrian Emperor Joseph II shut it down. The complex reopened in the 1800s and has been a lively religious centre ever since. Over the years, it has hosted notable guests, including Pope John Paul I, who spent his summer holidays here, and Pope John Paul II. Lay men and women can’t stay inside the Weissenstein but are welcome at the Albergo Pietralba just opposite. Owned by the sanctuary, the Albergo is privately managed. It offers pretty rooms in Alpine style, with plenty of exposed woods and lovely views over the church and the mountains. It also has a bar and two restaurants, one of which is self-service. There is also a youth hostel, situated just outside the fir wood, for groups. Prices for the albergo start from €38 for a single room per night in the low season (B&B basis) and go up to €72 for a double room in the high season. The Weissenstein is the perfect base for nature walks and Nordic skiing. Bus services also link it to the Alpine pistes of Obereggen – Pampeago. For more information check: www.weissenstein.it (in Italian or German only), call +39 0471 615 124 or email info@pmw.it. Surprisingly, the monastery wasn’t always a haven of peace and quiet. Founded in 1198 by Ranaldo of the Counts Ranaldi, it had to be abandoned in the 16th century because bands of brigands and robbers scoured the countryside, endangering the nuns. Fleeing their original convent, they sought refuge in what became the current monastery, a village house belonging to the Andreozzi family, in the heart of Bevagna. This solution worked well for nearly 400 years—until Napoleon came and dissolved the monastery. Reopened in 1815 as part of the Restoration, it was shut again in 1860, this time by the Italian government, which also confiscated the property. The nuns finally managed to buy it back in 1899, and it has been open ever since. Despite this tumultuous history, few places today could be more conducive to stress recovery than this yearningly beautiful convent. A group of medieval buildings linked by stairs and porticoes clusters around a verdant cloister garden. The thirty guest rooms, which are open to families and groups, are simple but charming, with sober wooden furniture. “Simple, genuine and abundant” food is served in a vaulted refectory which looks straight out of a medieval manuscript. The nuns also make and sell honey, jams, biscuits, olive oil and wine. Prices start from €60 per room per night on a B&B basis. Family discounts are available. The monastery is the perfect springboard to explore Bevagna, Assisi, Trevi and Montefalco. For more information visit www.benedettine.it (in Italian only), e-mail: info.prenotazione@benedettine.it or call +39 0742 360133. One of Tuscany’s greatest monasteries, Monte Oliveto allows people who wish to embark on a spiritual journey to stay at its guest house. Other visitors can book a room at the monastery’s Agriturismo, which is situated nearby. For more information, check www.monteolivetomaggiore.it, email: foresteria@monteolivetomaggiore.it (for the guest house) or azienda.agricola@monteolivetomaggiore.it (for the agriturismo) or call 0577 - 70 76 52 (for the guesthouse) or 0577 70 72 69 (for the agriturismo). The last nuns left this monastery in 1976, but the Catholic association that manages it, and also looks after the Baroque sanctuary nearby, turned it into a religious turism centre. Guests, including lay people, can stay in one of the monastery’s 34 simple rooms throughout the year. The food on offer is some of the best ever sampled in a religious institution. For information, visit www.monasterpuritas.it, call +39.081.916385 or email puritas@tiscalinet.it.